This patient had clear watery runny nose coming from one side of the nose every time she leaned forward. It turned out to be brain fluid or cerebrospinal fluid (CSF) and the patient runs the risk of developing brain infection (meningitis). 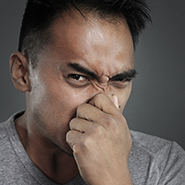 A blocked nose can be a major annoyance in the day and cause us to have poor sleep quality at night. It can also be a symptom of more serious problems like polyps or even tumours. An ENT surgeon can help exclude serious problems with the aid of an endoscope.